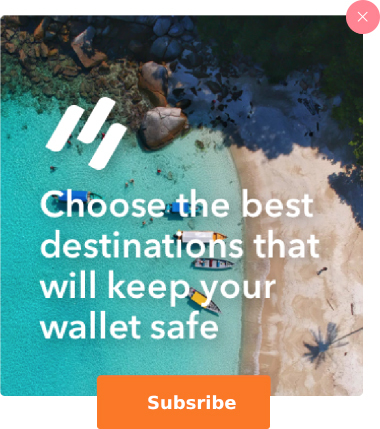 If you were to assign personality profiles to each European country, Spain would definitely fill the slot for the warmest and most fun-loving nation. And it’s easy to see why. Spain has every ingredient included in the perfect recipe for a good time. Spain boasts one of Europe’s sunniest climates, which makes for mouthwatering produce and three distinct wine regions. Its landscape is filled with stunning and diverse terrain, from the legendary Pyrenees Mountains to river-carved canyons to sprawling beaches. Spain’s major metropolitan areas are bustling cultural capitals full of music, art, and centuries old cathedrals. And with dozens of regional languages and dialects spoken within the country, Spain offers a deep cultural diversity. Furthermore, Spain is one of the more “extroverted” countries in Europe, whose people are friendly, welcoming, and eager to make friends. 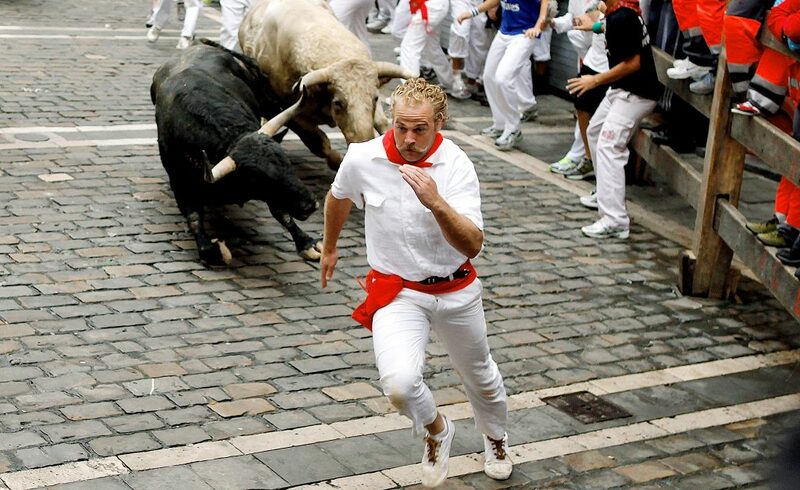 Each summer the small provincial town of Pamplona becomes an international hotspot for its legendary bull run. 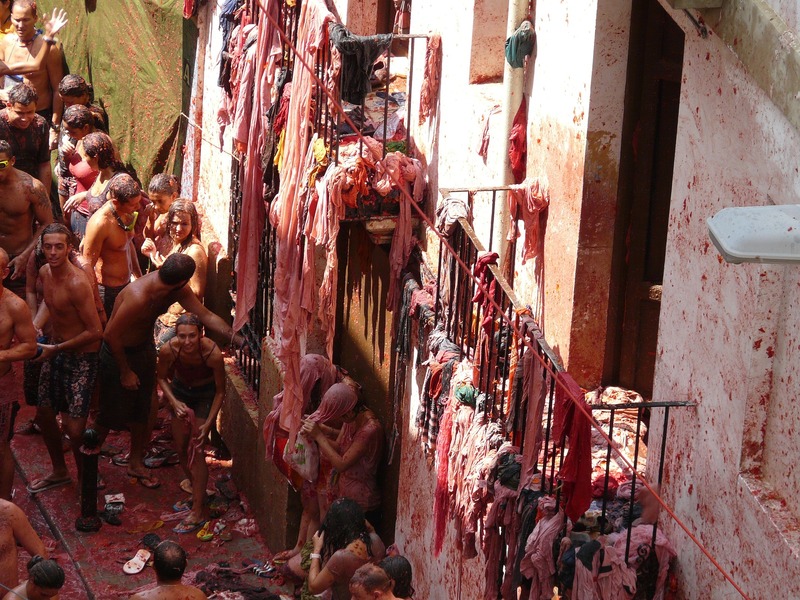 The origins of the San Fermin festival are not exactly straight forward, so it’s hard to concisely sum up why locals and visitors have willingly sprint down Pamplona’s narrow alleyways in front of a stampede of raging bulls for centuries. But when you are there drinking the sangria, eating the tapas, and donning the traditional white get-up and red scarf, the excitement is so contagious that you won’t question it. These eight days each July are filled with music, delicious food and drink, and plenty of adrenaline. In 1945, a fight broke out between some rowdy teenagers and performers in a parade. After tomatoes from a nearby market stand were hurled, the fight was broken up by police. But this little scuffle made a lasting mark on the locals, who sought to repeat this fight each year during the parade. The authorities resisted at first, but in 1957 the event became sanctioned and has since grown to international notoriety. 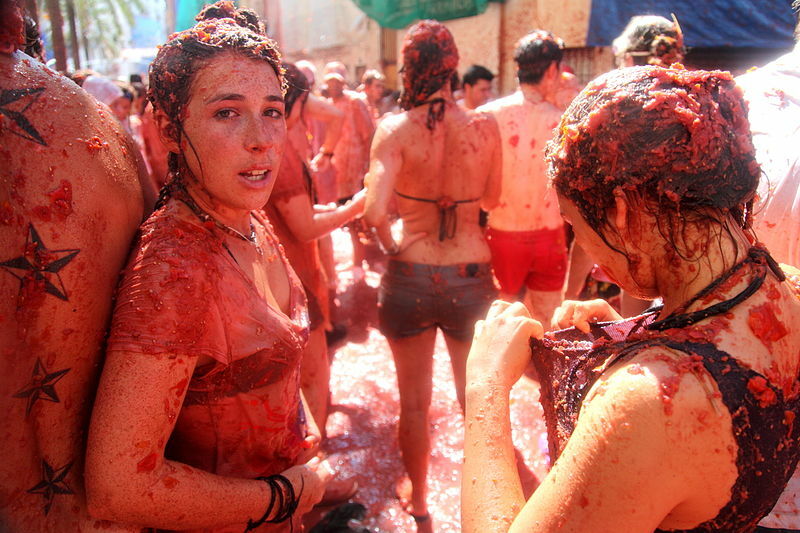 For an hour during the last Wednesday of August, downtown Buñol becomes a tomato warzone. In 2015, an estimated 160 tons of tomatoes were thrown by 45,000 people. After the festivities, firetrucks hose down the soupy streets. As an added bonus, the citric acid of the tomatoes works as a cleaning agent, leaving the city streets sparkling. The Falles (Spanish: Fallas) are celebrate for four days each March at the onset of spring. Like many holidays with pagan roots in the observance of the equinox or solstice, the Falles includes burning wooden effigies. But the Valencians don’t just burn things, they make an elaborate spectacle of carpentry and pyrotechnics of this affair. The first three days of the Falles transform the city of Valencia into an open-air art show, where over 600 giant and beautiful wooden sculptures are installed throughout the town as the backdrop for music, markets, and dance parties. On the final evening of the festival, they set fire to the sculptures in a blazing show. This is a Spanish festival with fireworks unlike anything you’ve ever seen! For those with nostalgia for the times of horse-drawn carriages, ornate dress, and ballroom-like socializing, there is nothing quite like the Seville Fair. 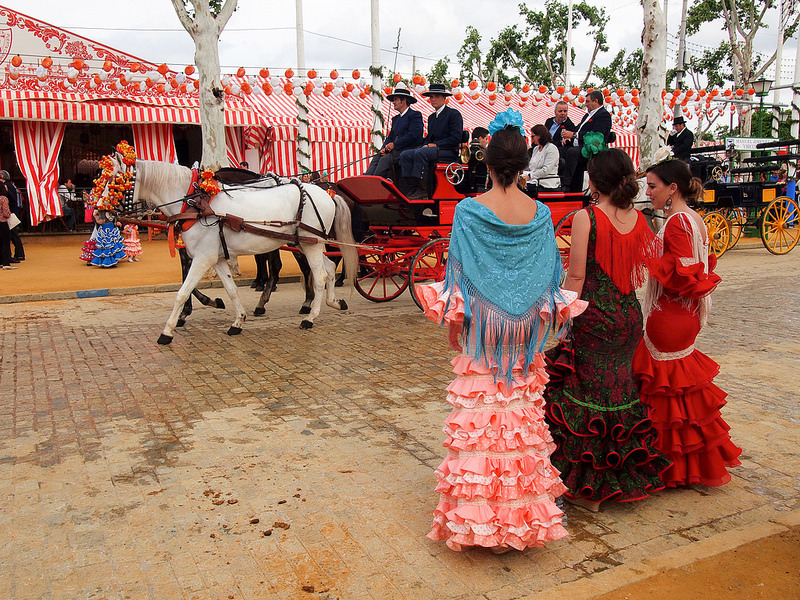 For a week each April, the Andalucian capital of Seville is filled with paper lanterns, top hats, flamenco dresses, horses, and buggies. The festival grounds are located on the banks of the Guadalquivir river and include traditional rides like a ferris wheel, massive tents for concerts and dancing, and a whole lot of food and wine. As with many festivals in Spain, he party lasts til the wee hours of the morning (many tents won’t close til 7am! ), so be sure to pace yourself. The Seville Fair grounds. Source. For five days each July, the northern coastal city of San Sebastian hosts over 100 jazz and blues concerts on 12 stages. With so many beachside amphitheaters in San Sebastian, it’s hard to imagine a more picturesque setting in which to see the world’s premiere jazz and blues musicians. 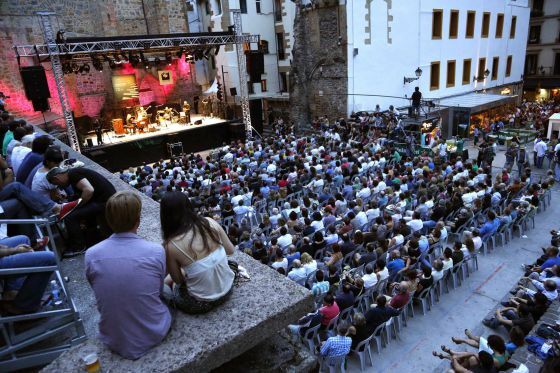 Not to mention, many of the venues at Jazzaldia are incredibly old, making for a truly unique experience. Established in 1966 and now welcoming more than 155,000 visitors, Jazzaldia has hosted many musical legends like Ella Fitzgerald, Ray Charles, Herbie Hancock, and Bob Dylan. Taking place in the week following the Running of the Bulls, San Sebastian’s Jazzaldia is the perfect way to wrap up a summer of exciting festivals in Spain. For worldclass jazz in striking ancient and seaside venues, head to San Sebastian’s annual jazz festival. Source. Barcelona is a beautiful and fun loving destination any time of year, but la Mercè brings an atmosphere unlike anything else. As with many Spanish festivals, it’s hard to pin down the exact origins of this treasured Catalan holiday. Stemming from traditions honoring the Patron Saint of Mercy, who once saved the city of Barcelona from a plague of locusts, the festival has since evolved to encapsulate dozens of Catalan traditions. In addition to plenty of outdoor markets and open air concerts, watch out for some of the cultural highlights of the festival. 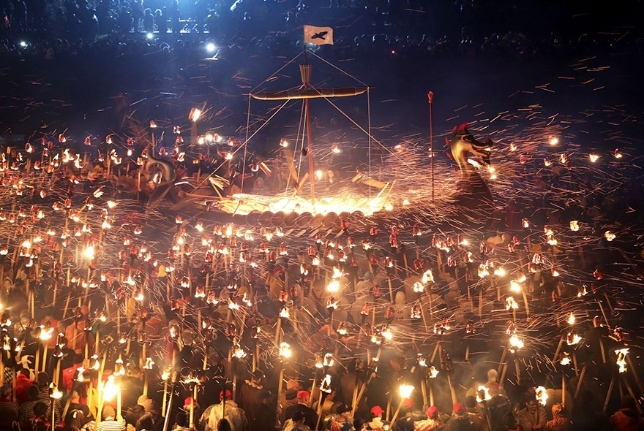 One is the Correfocs, in which people dressed as devils will wield burning pitchforks and march through the streets to an ominous drum beat as spectators run through a tunnel of fireworks. Another event not to be missed are the Castellers, a human tower that can be as tall as 10 layers high, acrobatically erected in busy city squares. 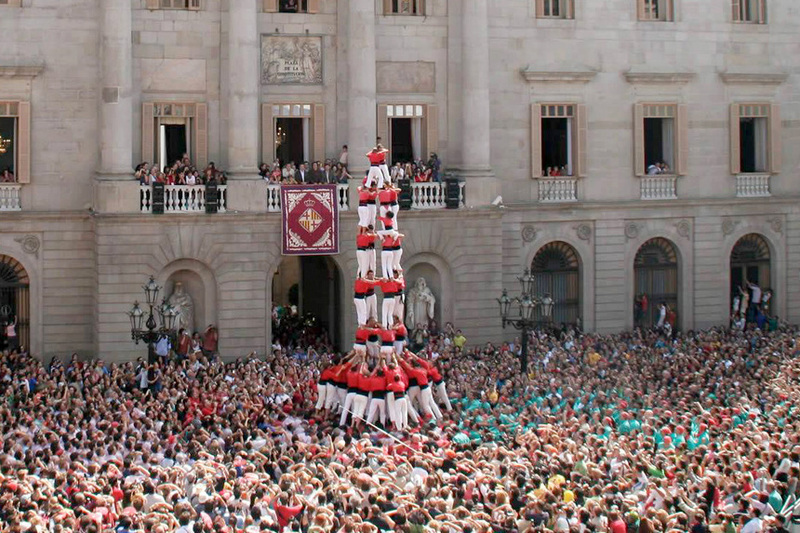 The famous Barcelona Castellers tower above the crowd. Source. Head to Running of the Bulls in Pamplona, Spain to witness one of the most incredible Spanish cultural festivals. 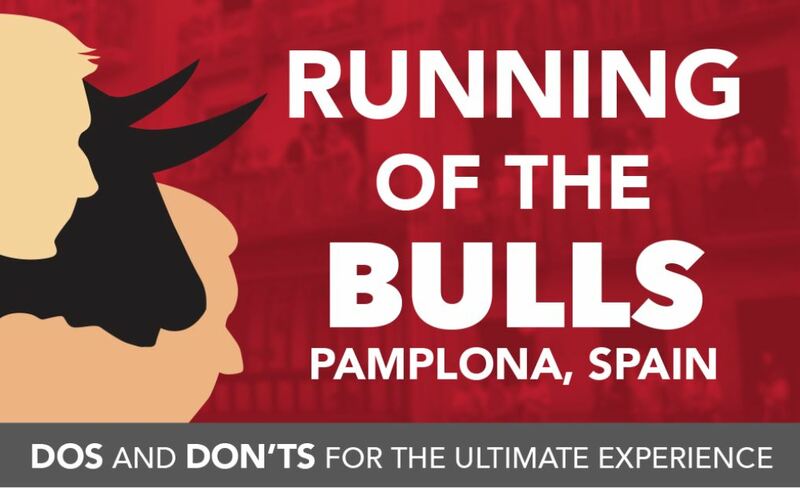 Filled with amazing food, drink, music, and the ultimate adrenaline rush, Running of the Bulls is a bucket list event you’ll remember for a lifetime. With our exclusive balcony access, you’ll have an unbeatable view of the action.